In the past few days, the California State lab confirmed three detections of Guava Fruit Fly in San Jose in Santa Clara County. As a result of these finds, the Secretary of Agriculture issued an emergency proclamation authorizing an eradication project. Treatment is scheduled to begin today, Wednesday, July 17, 2013 in a 19 square-mile area surrounding the discoveries using the "male attractant" technique. This technique uses ground-based, spot applications of minute amounts of insecticide and feeding-attractant lure. The treatment is applied as small, dollar-sized spots on inanimate objects such as street trees and utility poles approximately 8 feet off the ground to prevent accessibility and disruption to the public. The male fruit flies are attracted to the lure on these spots, and they die from feeding on the mixture. The Guava Fruit Fly infestation in San Jose marks the tenth time of detection in 17 years. Eradication projects were conducted in 2000, 2001, 2002, 2004, and now in 2013. The California Department of Food and Agriculture (CDFA) successfully eradicated the Guava Fruit Fly in each instance using the male attractant technique. The Guava Fruit Fly is known to occur in India, Pakistan, Nepal, Sri Lanka and Thailand. 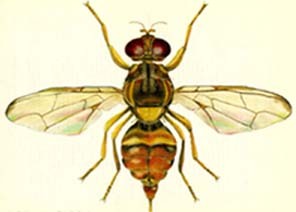 If allowed to establish in California, the fly has the potential to become a major pest of citrus, peach, and several kinds of tropical and subtropical fruits. Fruit damage occurs when the adult female fly lays eggs in the fruit which hatch into larvae or maggots that tunnel through the flesh of the fruit, making it unfit for consumption. These infestations are likely the result of contraband fruit smuggled into California. All those entering California should notbring fruit or vegetables back from your travels. Exotic fruit flies threaten California’s multi-billion-dollar agricultural industry and its native and urban environments as well.